It is the end of an era in photography. Photography has moved to a more digital world, and with this shift companies are beginning to phase out product. Kodak has announced that after 74 years of production the Kodachrome Film will be retired. To many photographers this is a sad announcement. Kodak has been manufacturing Kodachrome film since 1935. It was invented by two professional musicians, Leopold Godowsky and Leopold Mannes. Kodachrome was the first color film on the market that used a subtractive method. The brilliant colorsit produced made it a perfect film for publication and print media. In fact, the famous National Geographic photo of the “Afghan Girl” was shot on Kodachrome film. Kodachrome was also admired for its long storage life. Kept in darkness a Kodachrome slide retains its accurate color and density for over 50 years! Developing Kodachrome film is a complex process. It requires technicians with extensive chemistry training and a very large, difficult machine. Currently there is only one certified facility, located in Parsons, Kansas. Kodachrome film enjoyed its own little share of controversy. When it was first introduced one would purchase the film and the processing together. Once used, the film was sent, in the provided envelope, for developing by Kodak. In 1954, as a result of the lawsuit United States v. Eastman Kodak Co., this practice was found to be anti-competitive. Photographers from that point on were free to have Kodachrome film developed by independent processing labs. As this era of photography ends we are treated to this slideshowfrom Kodak, showcasing some of the outstanding work shot on Kodachrome film. Additionally, you can treat yourself to examples of photographs taken with Kodachrome film at the Flickr Kodachrome Pool. Enjoy. It is a thing of beauty, and will be missed. RIP, Kodachrome. I love June. Even if school let’s out in late May, it just doesn’t seem like summer to me until June. And here we are, June 1st. I am so excited for the summer ahead of us. Not because we have lofty summer plans or are going on any elaborate trips. Summer just makes me happy! So I have challenged Shane and Katie to come up with 33 things each that they would like/need to do this summer, and we will combine our lists and see how many we can cross off by the end of the season. I can’t wait! What are your family’s goals for the summer? Its the first of December…. 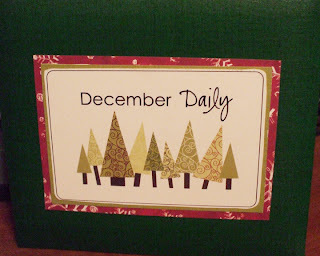 Time to start our December Daily series of photos! Let’s all try to take at least one photo a day from now until Christmas! Today I am wrapping up some gifts, so i will take a photo during that process for our photo today. If you are a fan of scrapbooker Ali Edwards, I am sure you have seen on her blog recently about her December Daily albums. I decided today that I am going to do one, and set about making my digital templates, so that all I have to do is place my photo of the day and add jounaling. I made one template for horizontal photos, and one for vertical. Well the process was SO easy, I ended up creating an album of Dec 2007, and will continue 2008’s in the same album. I divided the years with tabs so it will be easy to navigate. I was very pleased, it took me about an hour to create and print the 6×6 pages. After work tonight, I cut out and compiled the album. I was surprised, with no conscious effort on my part last year, I had at least one great photo to use from 16 out of the 25 days. I used photos of holiday activites, things we made, our winter weather, decorating the tree, etc. I encourage you, even if you are not a scrapbooker, to take one photo a day during the upcoming holiday season, and capture the small details of your families life together, it is SO worth it! 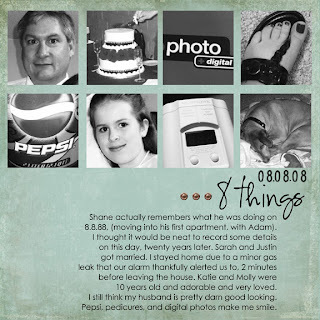 even if you are NOT a scrapbooker, you gotta check this out, and its FREEEEEEEEEEE!!!!!! and the layout i did..
with a slightly different spin…. So, I have not posted much lately, so very sorry for any of you that have been concerned. We are fine actually, just seems that I am busier than normal, and can’t quite get in the groove. Kind of sad today, one of the older gentleman in our church, who we are all very fond of, took an unexpected turn for the worse, and passed away last night. So very sad for his family, and our church family as well. So that has taken a little bit off my utter excitement for tomorrow. Yep, it Friday. But it is also Cathy Zielske Day! Not offically mind you, but in my little world, it is. 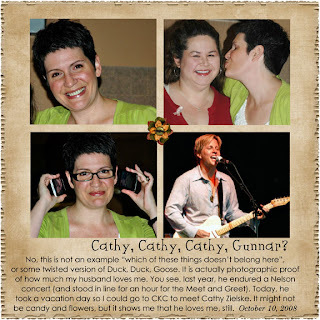 At 8:30 CST tomorrow baby, I will be spending an hour with CZ in her Connect with Cathy class, at CKC-KC. I can hardly wait! Can you tell?!?! Check this out, this is from the chick that wrote Encyclopedia of an Ordinary Life. Such a cool idea, I really want to participate.